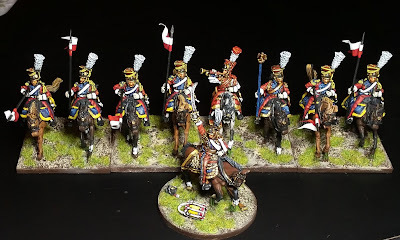 It's been quite long time away from blogging and anything hobby-related for me. As I mentioned a month or so ago, I was in the process of moving from our home which we had lived in for 14 years. We managed to sell our old home and acquire another one with the proceeds from the previous one. The new digs are a lot closer to work for me, and also to Puget Sound - we love being near the water. Today marks exactly one week being here. The first few days were filled with unboxing our stuff, hanging blinds and all the assorted details of setting up a new home. I did manage to set up my toys in between these mandatory duties. The living room is larger than our old place so I was allowed to have one wall section for my stuff. 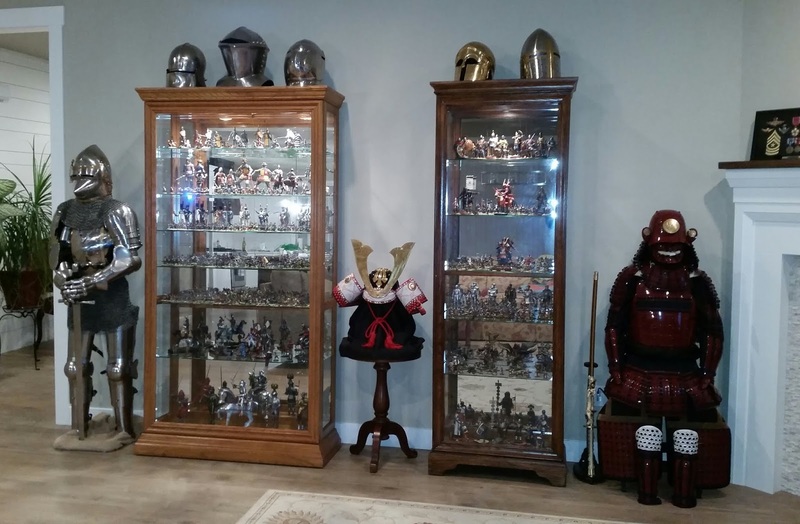 Amazingly not a single figure was damaged during the move. Granted it was only a local move, and I ended up putting most of the figures in plastic bins which I transported in my car. I used shredded paper from work to fill up the drawers of figures. It did a great job protecting the figures, but a bit messy removing it afterwards. Here's the balance of the figures safely stored in the bins. 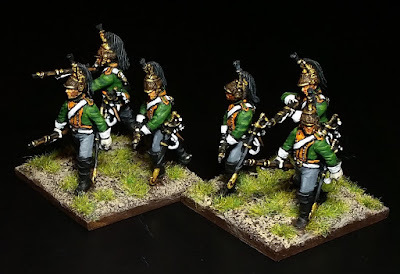 Still not sure when I will be able to set up a painting area as my wife doesn't want me spilling paint and stuff on the floors. Anyway, it's great not having to live out of a duffle bag as we did for the last month. Oh, and I'm hosting an inaugural gaming session here next month - a play test for my Black Powder game which I'm scheduled to host in May at Enfilade! Until the next post, best wishes to all and I'll be stopping by your blogs again too! Hello all! 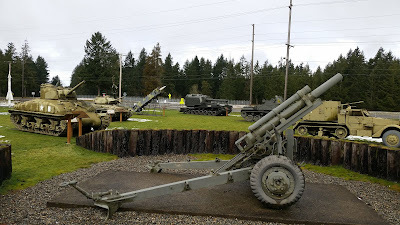 Still not moved to the new place yet, final stages of closing and a myriad of other paperwork to be completed, but managed to break away for a short (half-day) gaming event held at the Fort Lewis Army Museum. 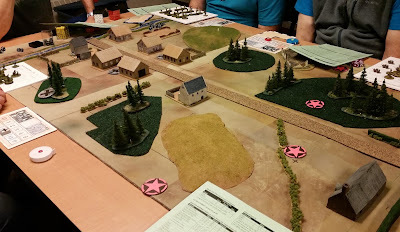 This was quickly put together between one of our longtime members, Bruce M (of Company B Miniatures) and the museum director, Erik, a recent Army retiree and also recent member of the Northwest Historical Gaming Society (NHMGS). Just a few weeks ago, Erik had posted on the NHMGS Facebook that he was looking to "liven" up the place with us hosting a gaming day there. 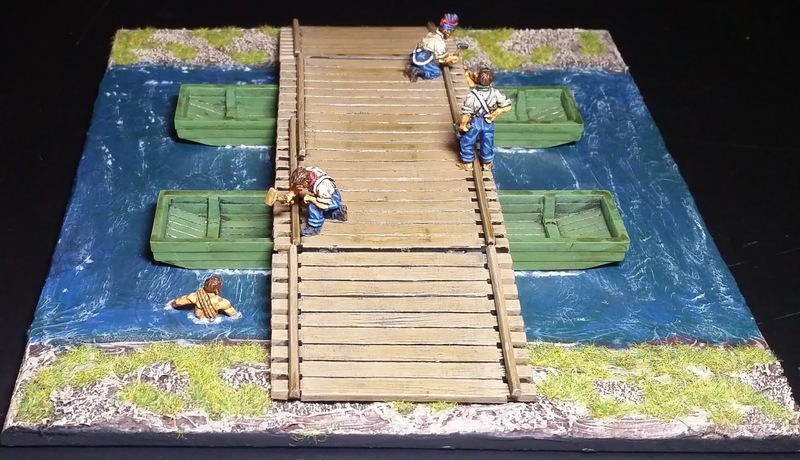 Erik said he collected and painted miniatures, but had never actually wargamed before and wanted to learn. The trap was set! Anyway, I hadn't been to the museum for close to 10 years, when I was still on active duty on Fort Lewis. Figured this was a perfect excuse to check it out after the place was renovated a few years ago. 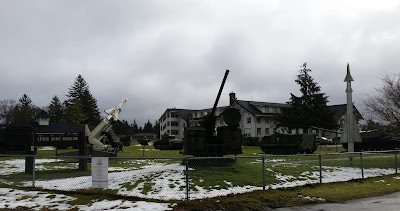 I drive past it everyday on my way to work in Olympia - a few miles south of Fort Lewis. 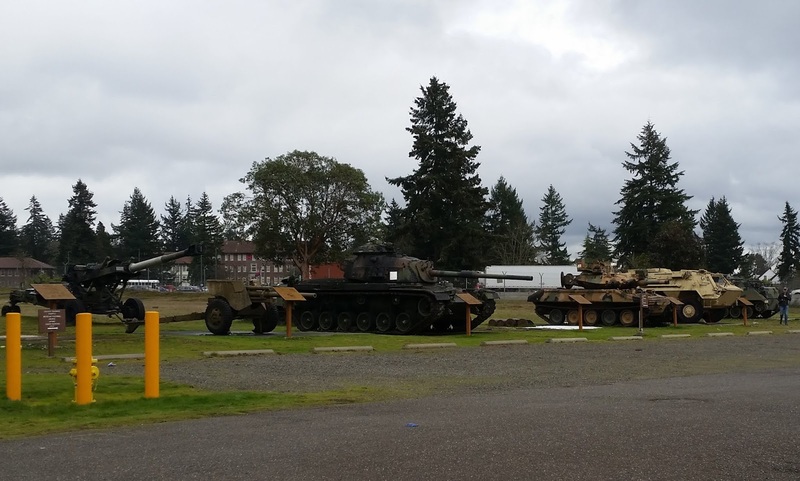 You can actually see the museum quite clearly from I-5 as it is just a few hundred meters away from it. Somewhat gloomy weather; perfect for indoor activities! 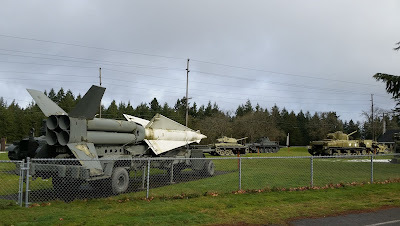 The poor Nike Hercules needs some TLC. 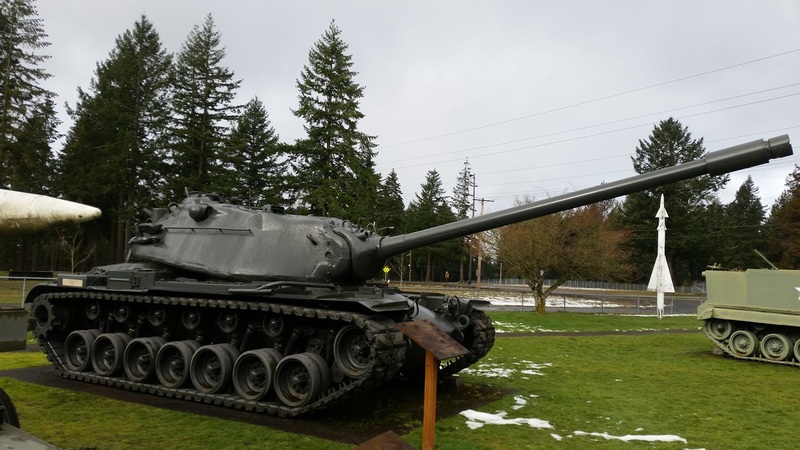 A view of the main park - a cast hull Sherman to the left, with a Chaffee behind it. 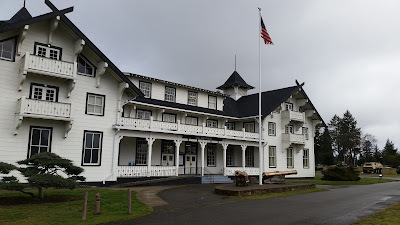 Front entrance to the museum itself. This is the side of the museum you can see as you head southbound on I-5. 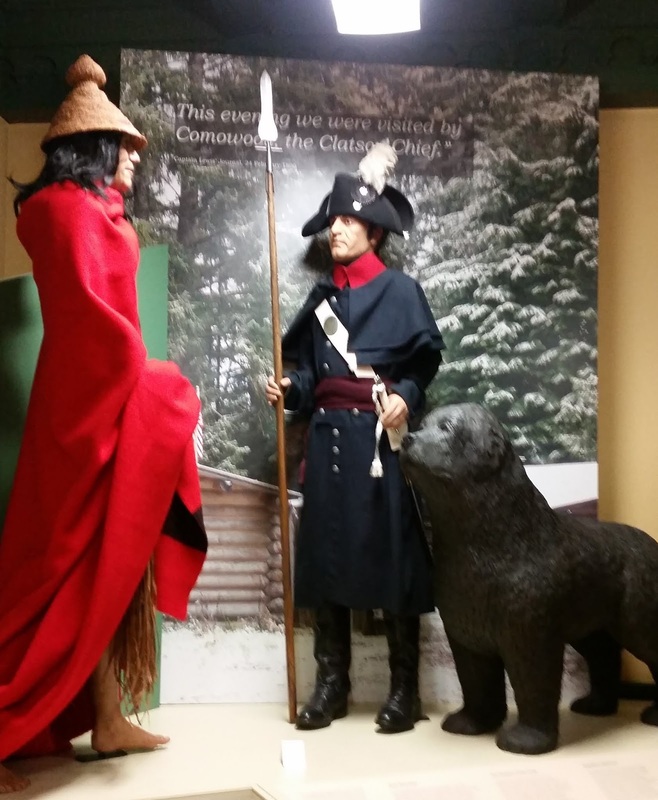 The museum and fort's namesake and his trusty Newfoundland dog, Seaman, meeting with a native Salish. 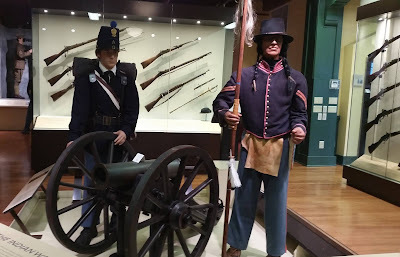 A couple of mid-19th C. locals. The guy on the left looks like a young Matthew Broderick. 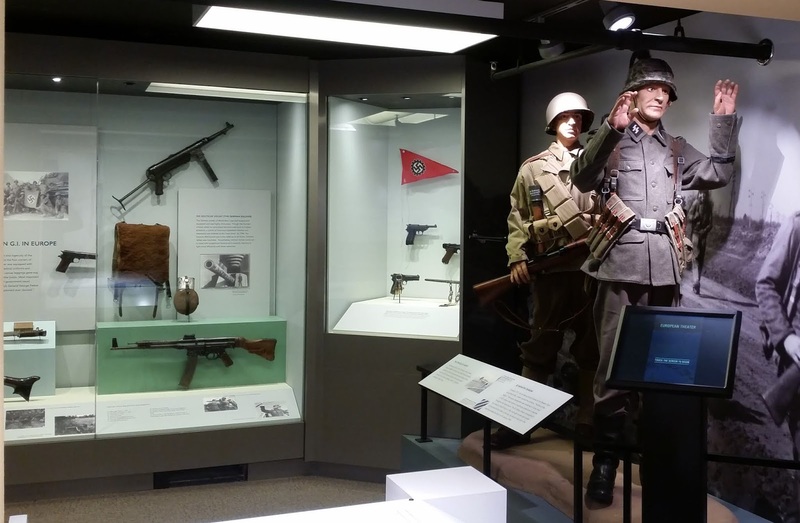 WW2 ETO display; the German mannequin begs an appropriate caption. 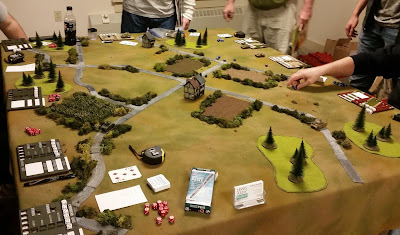 My buddy Lawrence B's What A Tanker game. Erik, the museum director, played in this game. He said he enjoyed it. 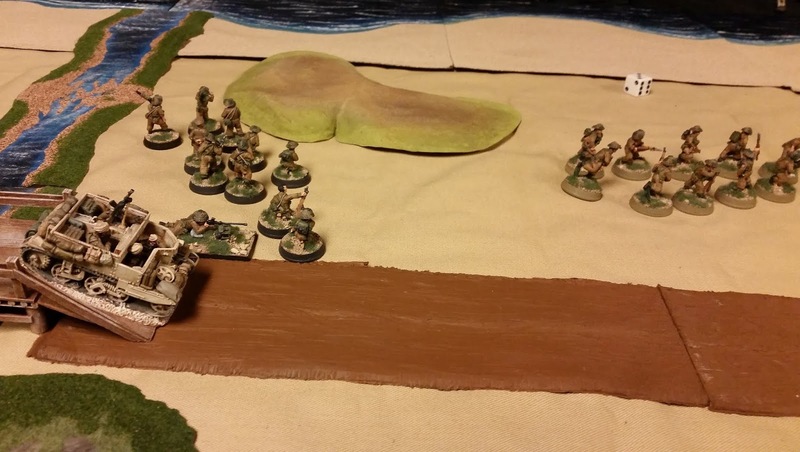 Tail of the Scorpion WW2 Malaya game using Combat. 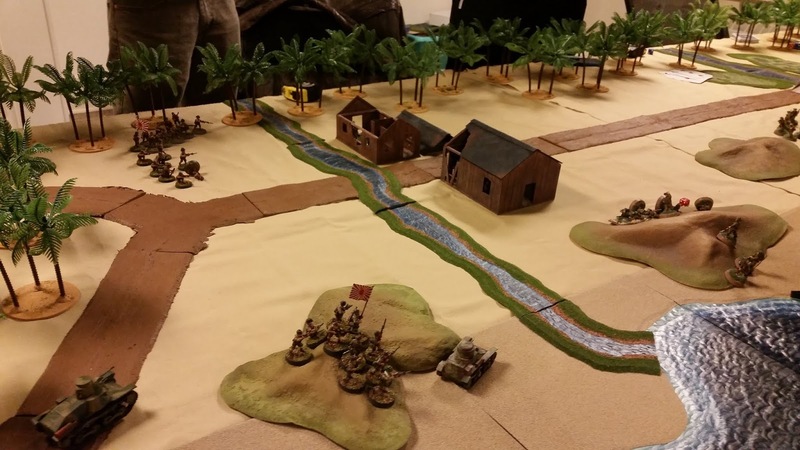 Close up of a personnel carrier crewed by Sikhs, from the Malaya game. 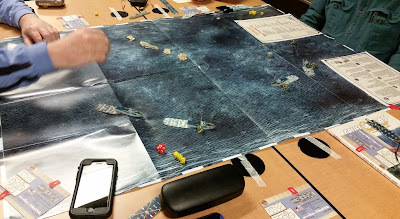 Cruel Seas game. I played in this game and ran two British Vospers. 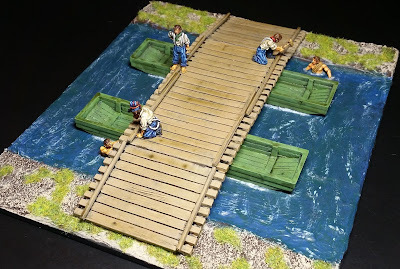 Against good advice, both historical and from the rules themselves, I chose to attempt to ram one of my Vospers into a German boat. The enemy successfully evaded the ram, I felt vindicated as I had made the larger vessel flee from me. A close up of some of Lawrence's handmade and camo'd What A Tanker game boards. Note the "Ambush" pattern on the one on the far right. 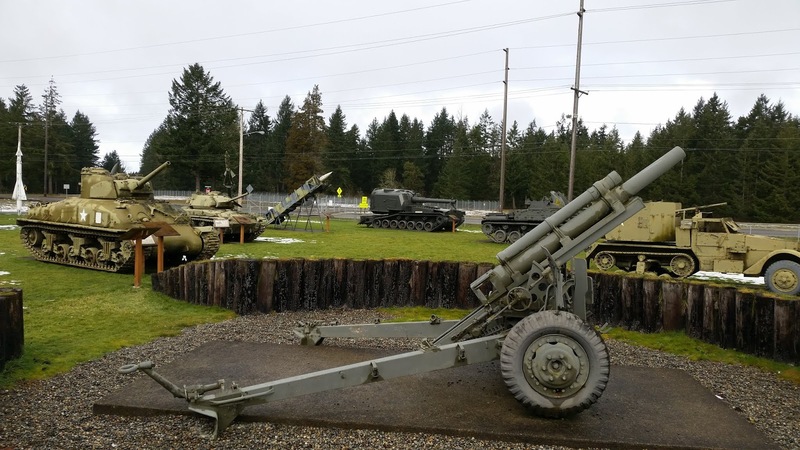 M55 Howitzer; another Cold Warrior, as well as a Vietnam War vet. 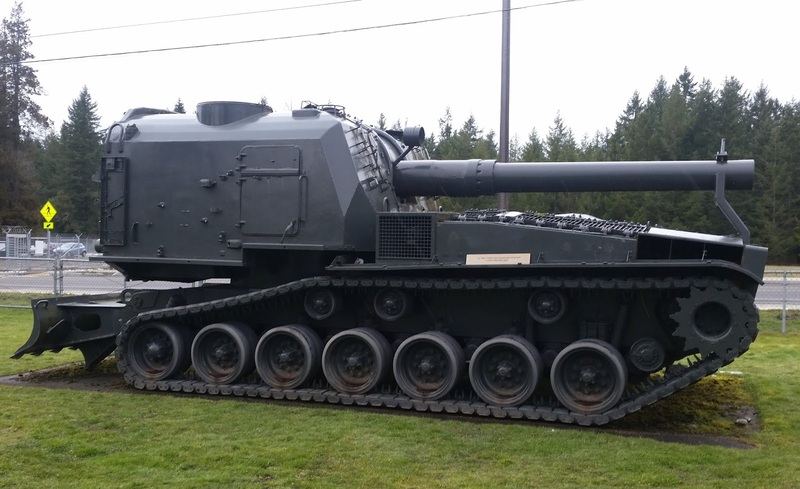 It had a 10 mile range! Modern armor on the north side of the museum - including a Sheridan next to the M60. Back in the 80's I served with the 3-73rd Armor, 82nd Airborne Div, which had air droppable Sheridans. It was known as the "Only Airborne Armor in the Free World" - this appropriate as the Soviets had a bunch of them. Well, thanks for stopping by and hope to get into the new place in a few weeks. It's getting old living out of my "duffle bag," so to speak. Actually, posting this to explain why I'll likely be "off the grid," at least for blogging, for a few weeks or so. We made a fairly quick decision to move - only about 30 minutes away from where we're at now, but a better location - both to live and and for me to commute to work. So, long story short, we already have the "ok" on the new place, but have a short period to get our current place on the market. Like the end of next week! We've been packing ever since Friday afternoon. 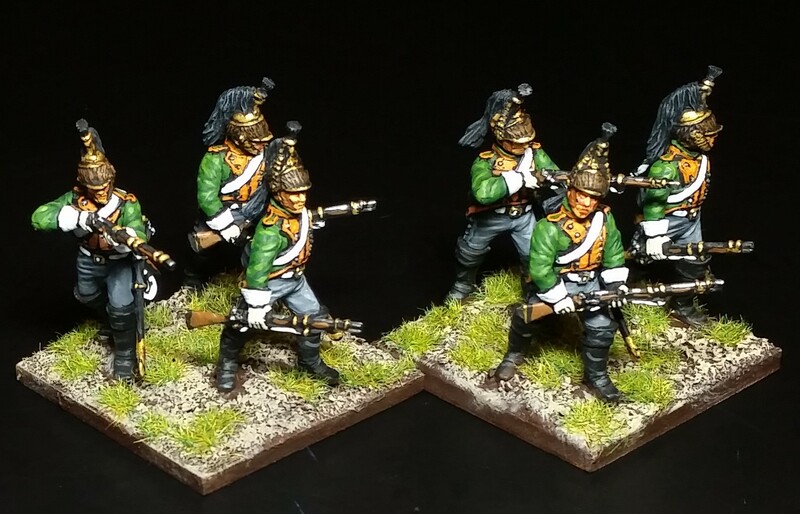 Had to cancel out on the Dragon Rampant game yesterday for obvious reasons. 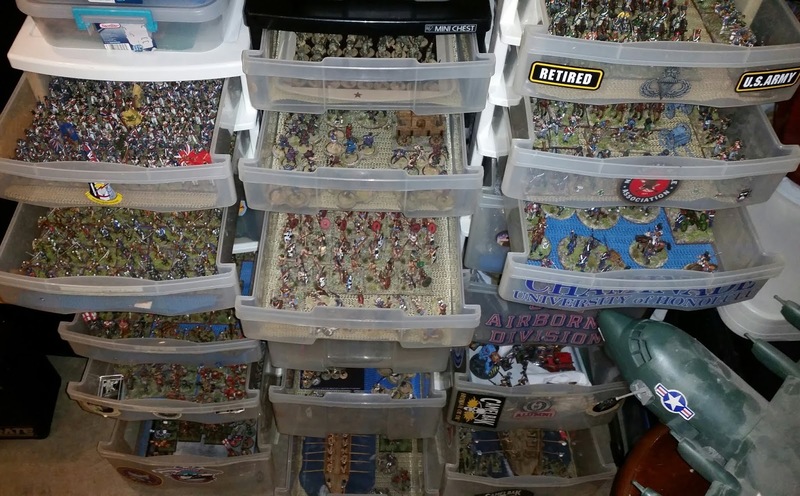 Stored most of the gaming figures in plastic drawers. We have quite a lot of "junk" having been in our current house for 14 years. 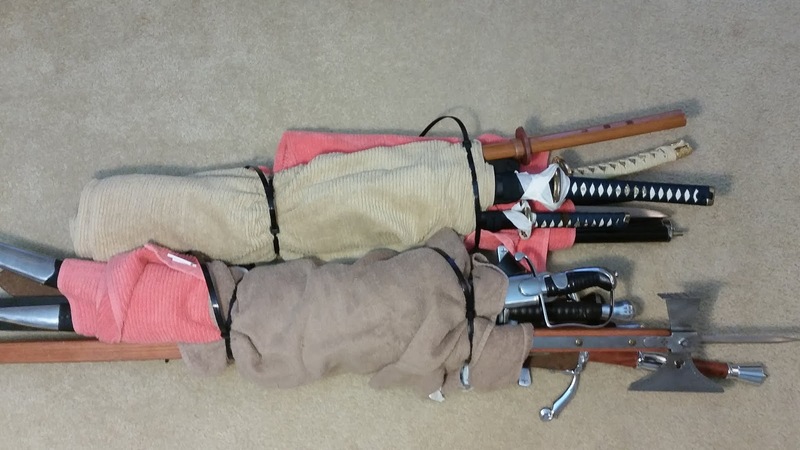 UPDATE - weapons are secured for travel. Anyway, hope to stop by your blogs when I can, but most of my time will be continuing to "sterilize" our place of personal belongings. Hope to post again in the not too distant future! Best to you all until then! 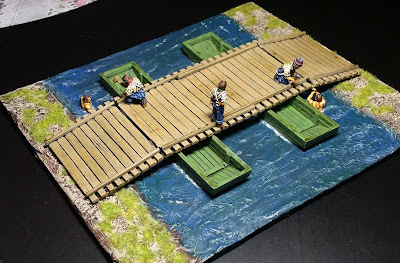 Pontoon bridge with French Pontonniers. 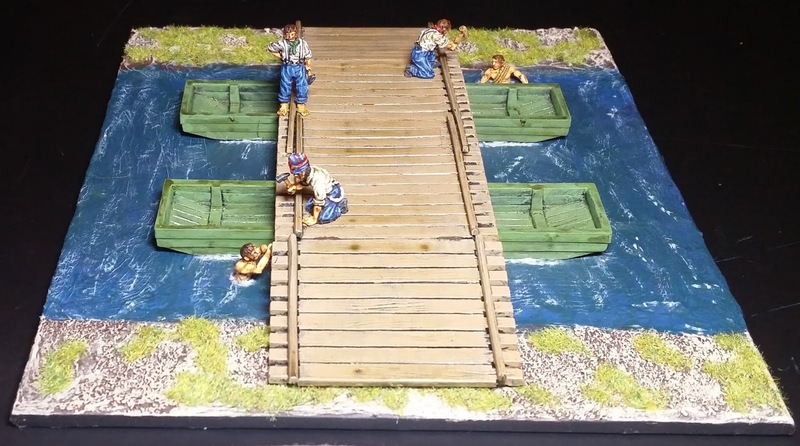 Figures are Perry metals and the bridge and pontoon boats are plastic made by Renedra and sold by Perry. This piece, along with the earlier group of sappers and engineers, will be part of the cav-centric game scenario. This is the last piece needed for a play test. Per the instruction illustrations, the ends up the bridge are shown upwards, but I flipped them down or ease of basing. 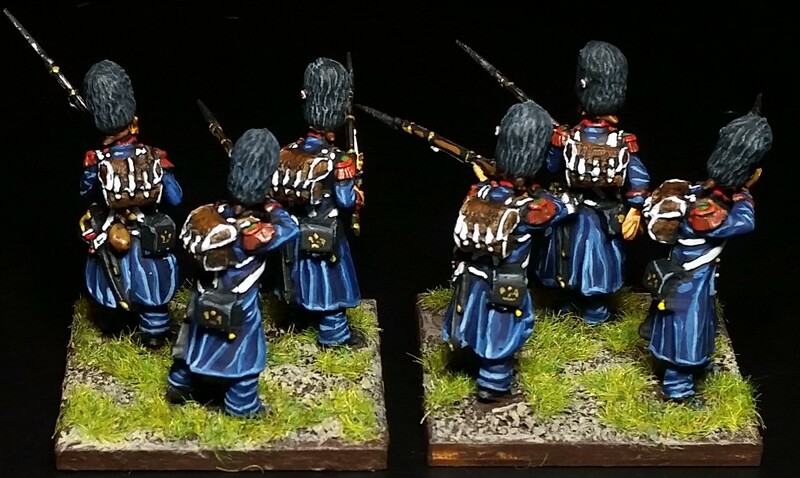 The Pontonnier set includes two officers which I'll add later on a separate base. The river pieces I have are about half the width of this section, but it'll have to do. A play test will have to wait as I'm participating in Dragon Rampant game day next Saturday. 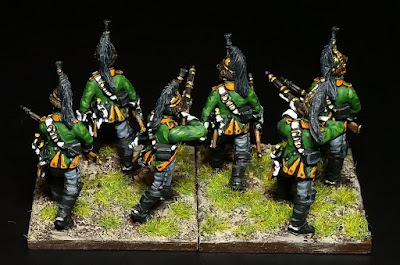 I plan to use my Men of East (Samurai) Warband. 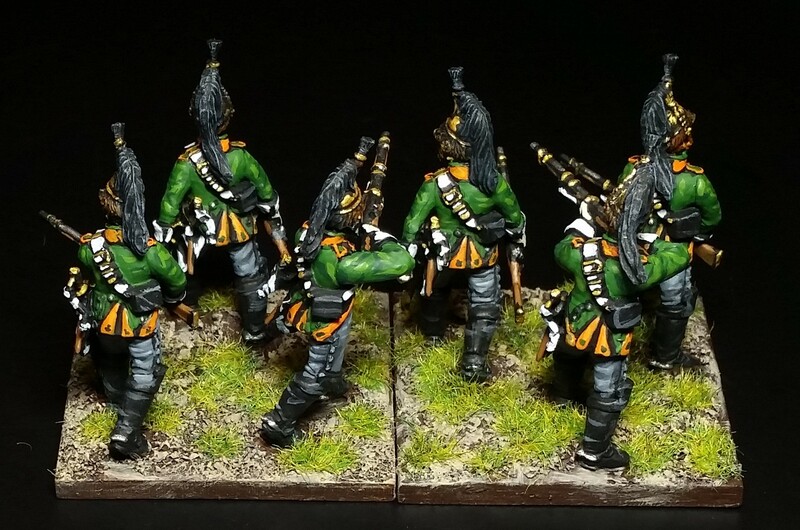 Basically my Lion Rampant Samurai "Retinue" with the addition of an Oni with spore attack. Thanks for stopping by and best wishes to you all! 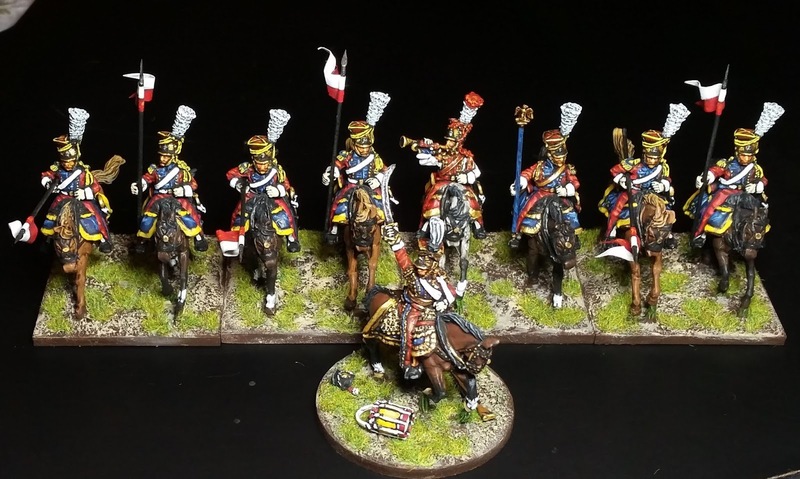 Just a few Perry dismounted French Dragoon skirmishers. 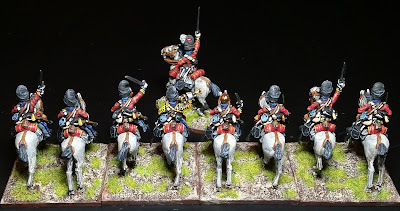 Another unit for a cavalry-centric Black Powder game I am scheduled to host at our annual big con, Enfilade!, in May. These figures were picked up as sprues from the Perry's plastic accessories page. In fact, the mounted Dragoons I have were left overs my buddy gave me for painting up some from his set. 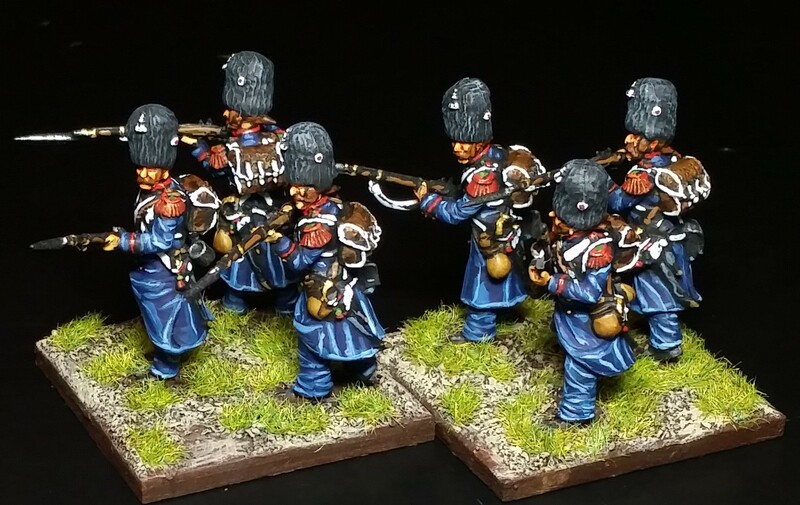 I had forgotten that these figures have three arm set poses; firing, musket at low port and trail. I had painted up a few for my buddy along with the mounted guys. 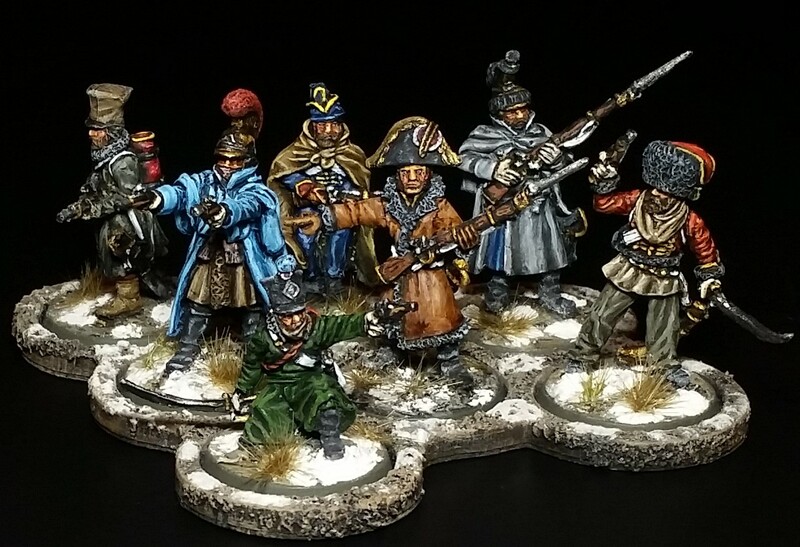 These are the ones I painted for my buddy some years ago - in coats with Spanish brown cloth. Kind of a slow start for the new year as I tend to paint in spurts. Mostly long sessions on weekends with lethargic lulls in between during the work week. After a long day at work, followed by defensive driving on I-5, all I feel like doing is laying on the couch sipping watered down box wine and watching YouTube videos of prison stories and bigfoot encounters. 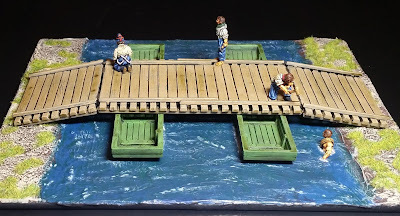 Next up is the pontoon bridge and pontoniers. Once they're done, I hope to get a play test going. I keep saying that, but keep wanting to add more figures to the game first. Well, best wishes to you all and thank you very much for stopping by. No big whoop, as far a projects go...but I did manage to snag a couple of bargains off of ebay the first couple of days in January. They arrived today and yesterday, along with a small Perry order made in late December last. Well, to be honest, I'll likely be using ebay a little less after finding out that staring January 1st, 2019, sales tax was added to purchases for buyers in 3 of the 50 States - Washington State being one of the culprits! 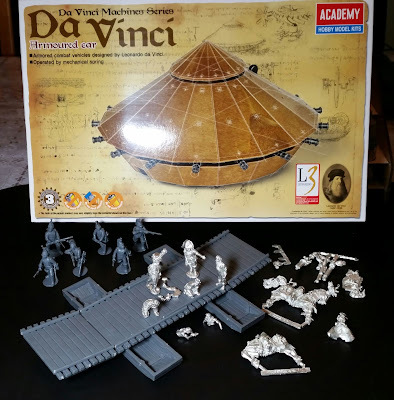 Anyway, the two ebay purchases are a model kit of Da Vinci's "tank" and an OOP metal Games Workshop kit of an Empire Master Engineer on Mechanical Steed. 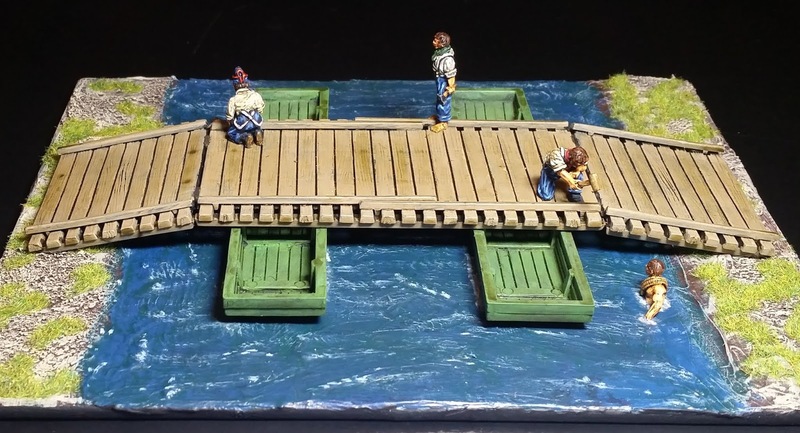 The Perry order consists of six plastic French Dragoons on foot and a plastic pontoon bridge and metal pontonniers. The Da Vinci "tank" looks to be about right for 28mm. Supposedly the tank was to be operated by about 4 men. 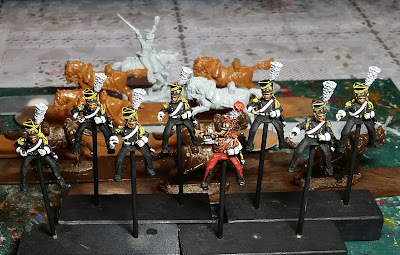 I managed to glue together the Dragoons and bridge this afternoon at work on a "break." :) Very simple indeed! Anyway, I just wanted to let you all know that I haven't totally vegetated in the new year. Hope you all are doing great and hopefully I'll get some paint slapped onto these odds and sods soon. Best to you all! These Perry Red Lancers, led by the Colbert figure with an arm in a sling, are likely the last figures I'll paint for 2018. 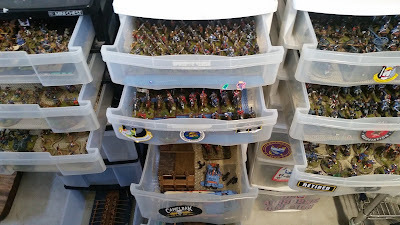 The 8-figure unit will be used in a cav-heavy Black Powder game I hope to play test in the new year. The Colbert figure will be used a brigade commander - or ADC. 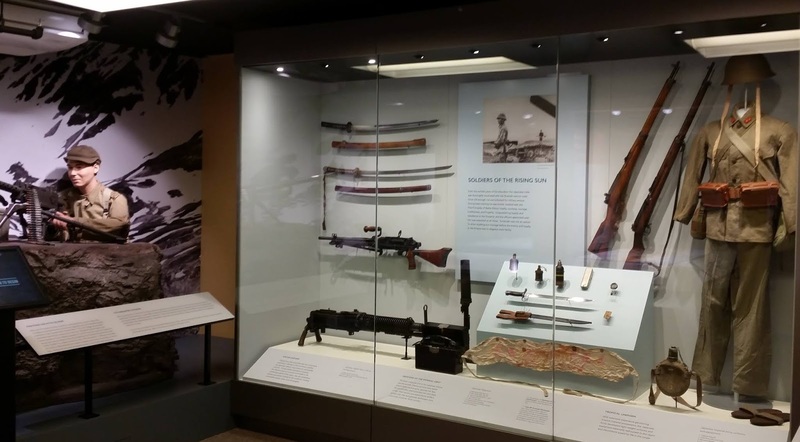 Although not present in the Peninsula, they participated in the Russian Campaign where they suffered heavy casualties. 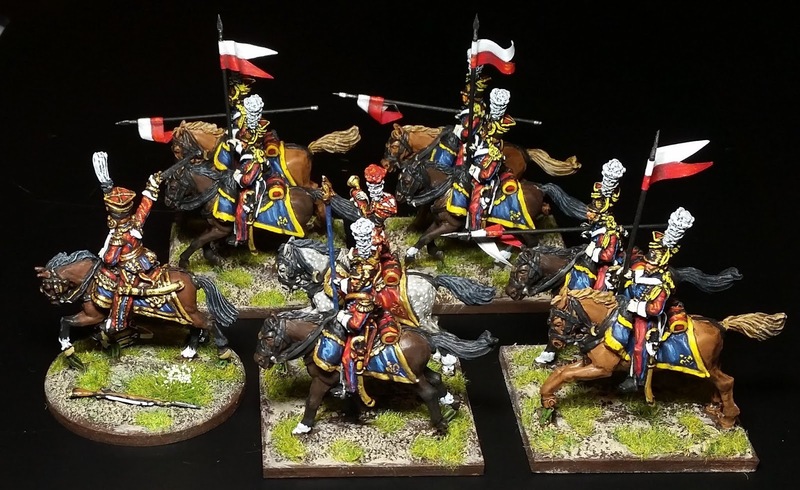 Thereafter they fought in the 1813 and 1814 campaigns, and finally at Waterloo where they were brigaded with remnants of the Polish Lancers. The striking scarlet colored uniform is a must-have for the table top. Perry also makes them in campaign dress, but full dress is so much more snazzy. For purposes of Black Powder, they are classed between medium and light cavalry with 7 Combat dice, and also inflict -2 Morale saves to infantry and -1 to other cavalry. I know we still have a few days left in 2018, but I wanted to thank all of you for stopping by and leaving such nice comments. 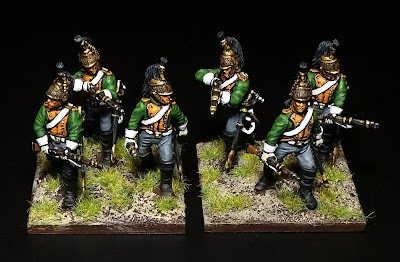 Hobby-wise the year started out fairly slow as I had geared up for Enfilade! 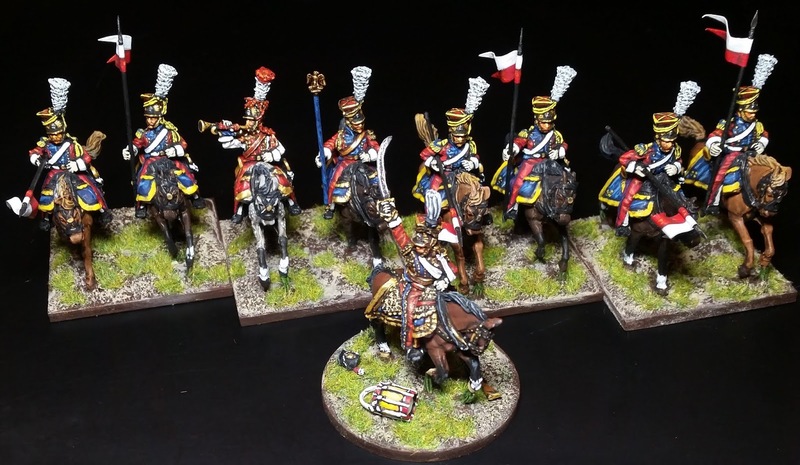 in May with Wars of the Roses games using Lion Rampant - most of the figures being painted up in the previous year. 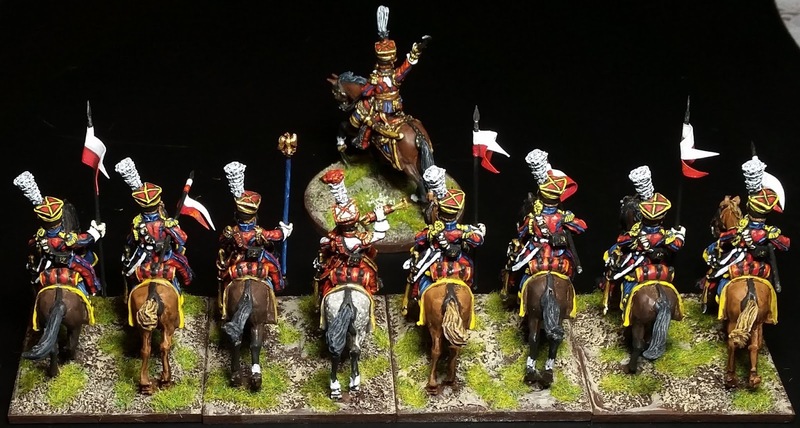 Soon after the convention, however, I had a relapse into Napoleonics. To be perfectly honest, I hadn't touched Napoleonics since 2012, and the release of the 2nd edition of Black Powder several months ago coincided nicely with this return. Anyway, it's been a pleasure reading your comments and also visiting your blogs as well. Looking forward to what 2019 will bring! From "The Last Frenchman in Russia" and friends. Not to worry as he made it out of Russia and went on to be a math teacher in North Carolina. 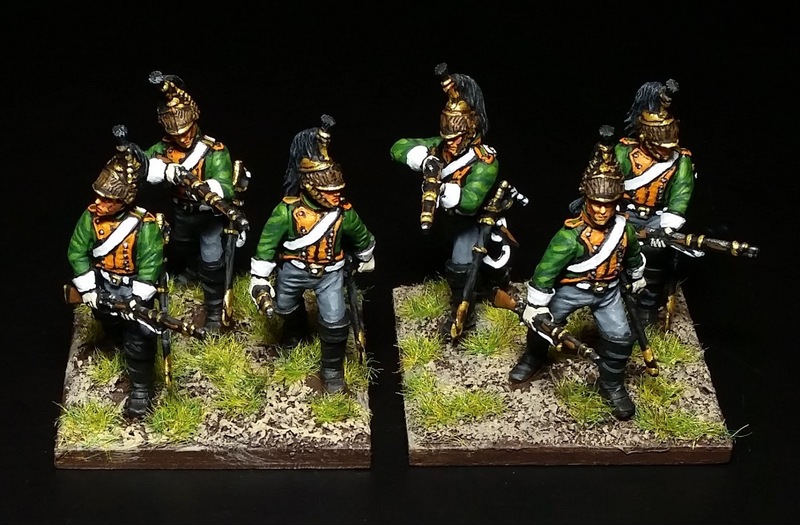 These are figures which I painted a few years ago and already posted somewhere on this blog, but recently put them on a multi-fig base from Litko. 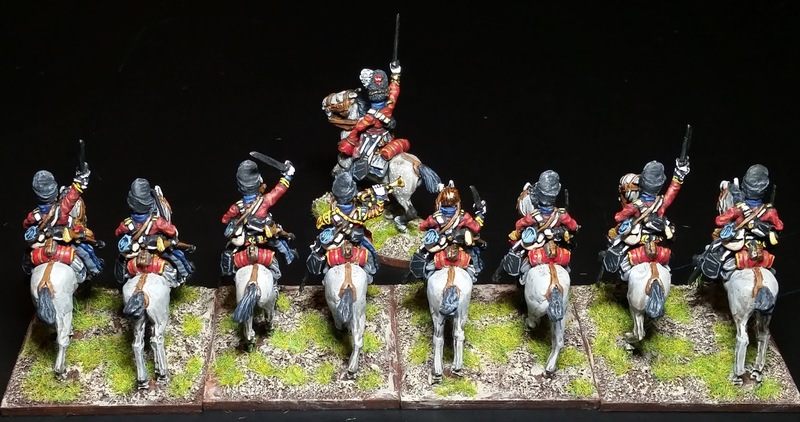 On the workbench, which will likely be the last figures for 2018, are Perry Red Lancers. Till next time, wishing you all the very best for Christmas! 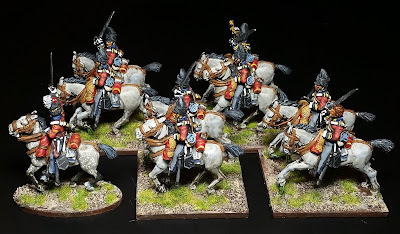 Here's a unit of Scots Greys which will be used in a cav-heavy Black Powder game based on a scenario in the 2nd Edition - "The Eve of Waterloo." As with the rest of my cav, they're in 8-man units. 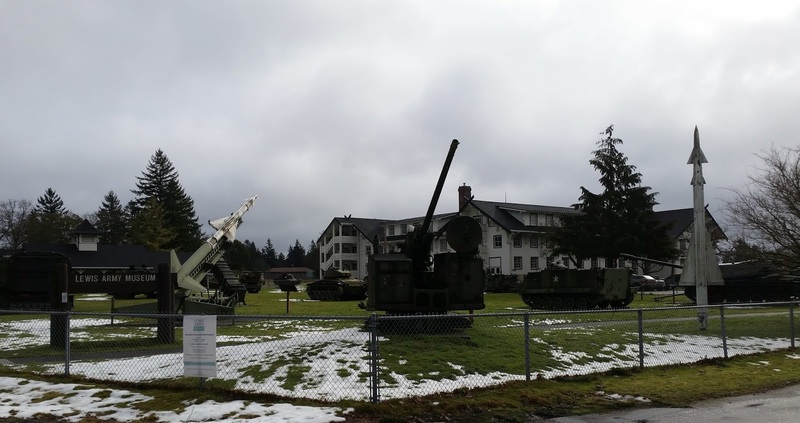 The officer will be used for either a brigade commander or ADC. 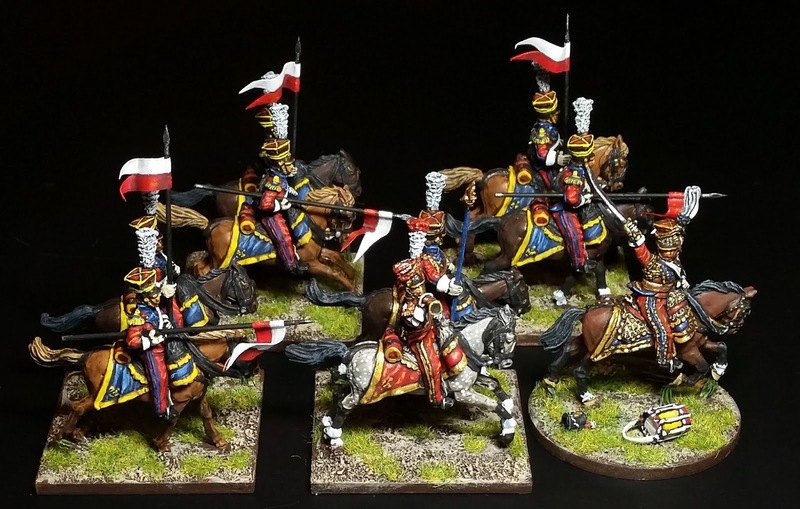 They are the first metals, besides the few Black Hussar specialty figs, I've added in a while. The weight difference from plastic is quite apparent. They'll be another heavy unit for the British, who should be a good match against French Cuirassiers and Dragoons. 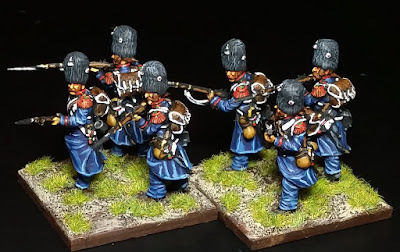 They didn't participate in the Peninsula, but famously advanced at Waterloo - not quite a charge - and assisted the 92nd Highlanders in repulsing the French line. 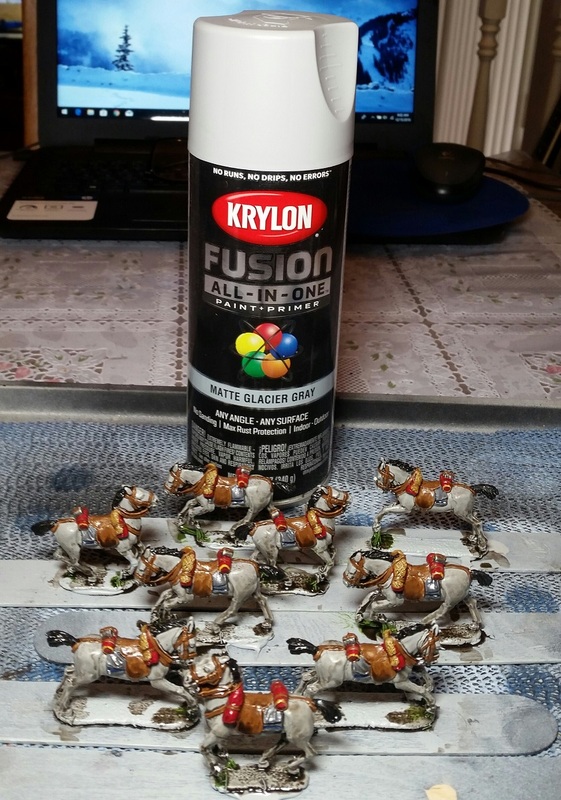 A can of Krylon Matte Glacier Gray sped up painting the horse flesh which was followed by Minwax staining. 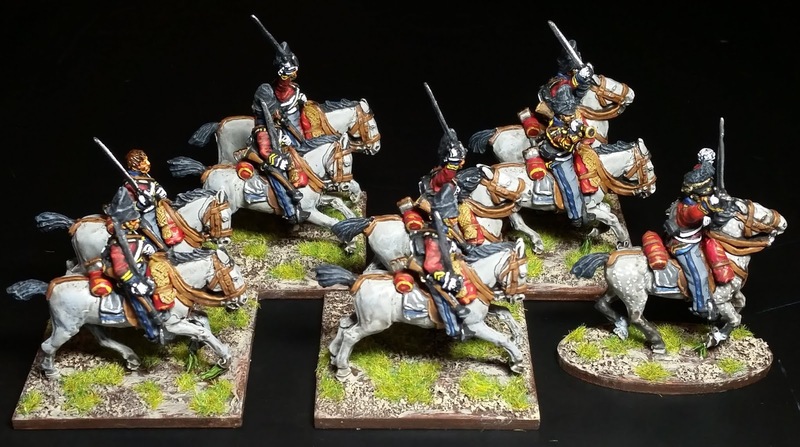 Next up are the Red Lancers - also Perry metals. 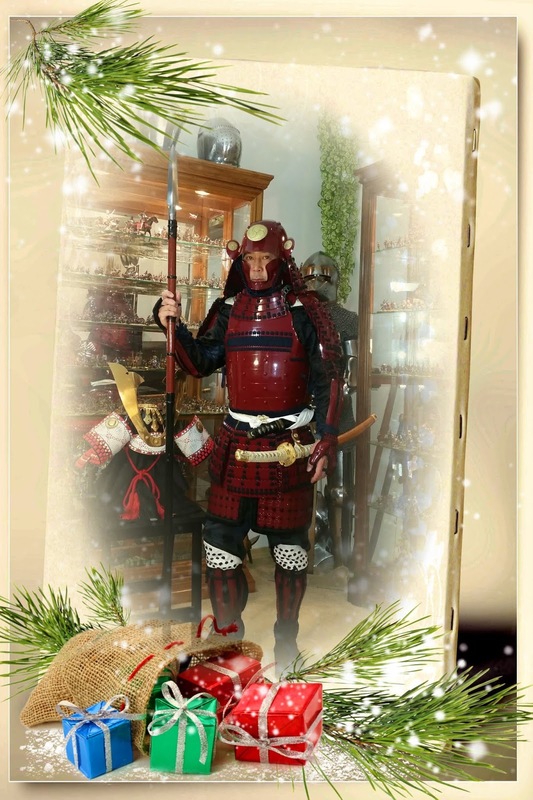 Until then, wishing you all the best during the holidays! 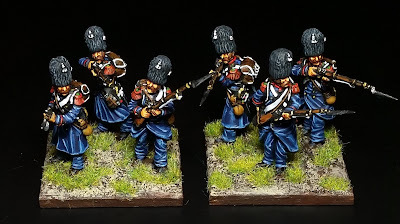 Another small unit of skirmishers for Black Powder. 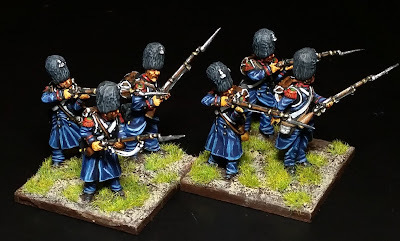 These were left-over figures from the Middle Guard set painted up a while back. The set comes with grenadier and chasseur bearskin head sprues, as well as the shako heads. Vallejo Dark Prussian Blue works well for the base coat of the clothing. Varying amounts of white added to the blue are used for the highlighting. The Guard greatcoats were generally of higher quality than those of the line; including piping around the collars and cuffs. They have an elegant look which rivals full-dress, IMO. There should now be enough units of foot skirmishers for a cavalry-centric game. 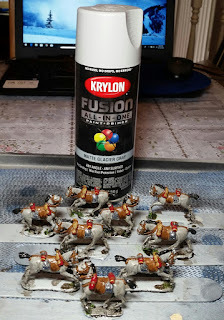 Up next, well after I do some home-owner repairs, will be the Perry cavalry - Scots Greys and French Lancers. Until then, wishing you all the very best during the holiday season!